1. For this science fair project, the independent variable is the roughness of the sandpaper and the length of time the participants have suffered from diabetes. The dependent variable is the participant’s choice of the roughest sand paper from the box. This is determined by observing which piece of sandpaper is picked by the participants. The constants (control variables) are the size of the box, the number of persons in each group and the size of the cut sandpaper. 2. The empty black box is sealed with masking tape and a round hole is cut in the box - just large enough for the participants to put their hand in and out. 3. The 3 types of sandpaper are cut to 50mm x 50mm size. Ensure you label the back of each piece with the correct ISO grit size. One piece of each type of sand paper is placed inside the black box. 4. The participants without diabetes are first tested one at a time. They are asked to put their hand inside the black box and take out the piece of sandpaper that they believe has the roughest surface. Once they have picked a piece, it is examined to see if they have taken out the right piece of paper (the piece with the highest ISO grit rating). The total number of participants that have taken out the correct sandpaper is recorded in the table given below. 5. Procedure 4 is repeated with the participants suffering from diabetes for 5 years, 10 years, 15 years and 20 years. The total number of participants that have selected the correct piece of sandpaper in each group is recorded in the table given below. 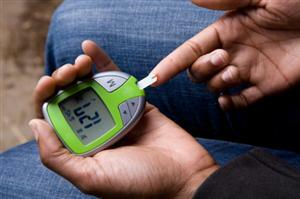 Requires the participation of diabetic patients.